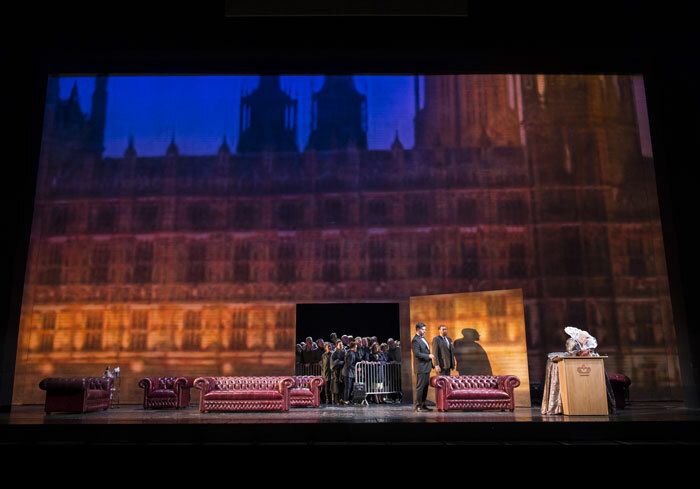 As Alexander Coghlan (The Arts Desk, July 6, 2014) pointed out, this production followed close on the heels of that of Welsh National Opera and was an altogether different approach as well as having a mezzo in the title role. He felt that the merging of the Elizabethan with the modern worked well after a slow start and was generally complimentary of both singing and playing. Of DiDonato, he wrote, "There’s a spontaneity to her ornamentation here that is less embellishment than organic emotional outpouring, connecting absolutely with body and mind. Her tone is endlessly flexible, colouring Donizetti’s four-square phrases with unexpected shades and stretching the predictable arc of his melodies into shapes that are at once unfamiliar and completely inevitable". 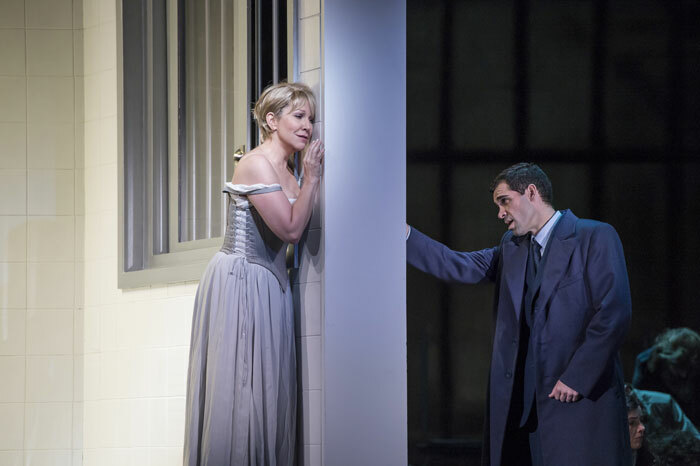 On the other hand, the strap line of Rupert Christiansen's (The Daily Telegraph, July 6, 2014) review was "Joyce DiDonato's enthralling singing saved a crass production of Donizetti's Maria Stuarda ", while he went on "let me just start by claiming that bel canto of this quality has not been heard at Covent Garden for more than a generation and that on the strength of this night alone, her name should rank in the operatic pantheon alongside the greatest legends of the past". 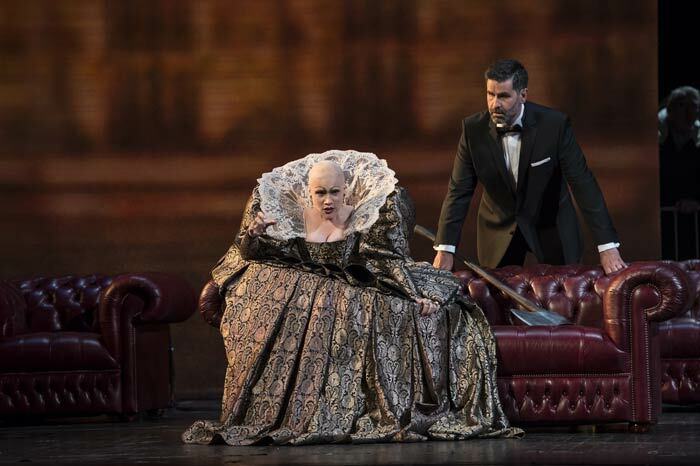 A division of attitudes to the production, while general praise of the musical values and of DiDonato in particular, characterised most of the reviews. The general view seems to have been that this Maria Stuarda was a poor production redeemed by magnificent music making. I didn’t have too much trouble with the fact that only the Queens were in costume – though having all the men in the same dark suits doesn’t aid identification (an all too common criticism I find). I presume it was to emphasise their otherness from the political processes, and to focus attention on them. Much more importantly the settings worked against the music and the words. There was no outdoors for Maria’s entrance; she watches a slide show of beautiful scenery instead. Thus that lovely entrance music, so light and airy, was compromised by being in a jail. We heard the sounds and talk of the hunt (kept in the surtitles), but there was no reflection in what we saw. The big confrontation was also in the jail, where Elisabetta sat down for a picnic. The detailed direction of that scene was pretty good - until Elisabetta threw her sandwich at Maria’s feet, Maria whipped the table cloth from under the crockery, and then brushed the remainder off the table with much clattering of breakages. Which reduced the characters to petulant teenagers. 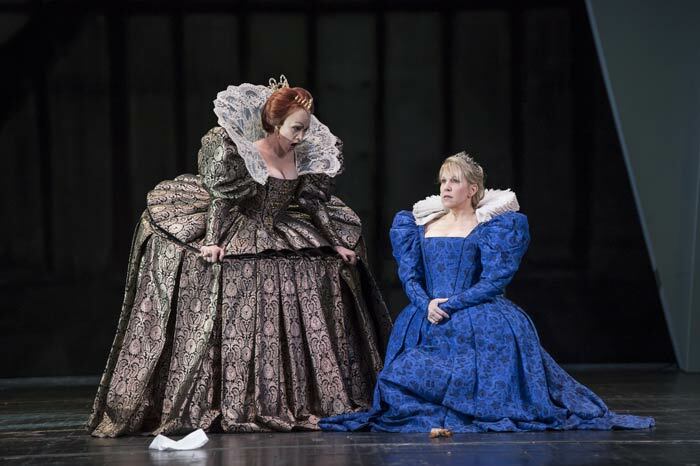 While I can believe that the real Elizabeth and Mary may well have behaved like spoiled teenagers when they didn’t get their way, it didn’t help Donizetti and detracted from the impact that this famous and wonderful confrontation should have. Elisabetta was still in the prison to sign the death warrant. In the final scene it seemed that Maria shared her cell with her liquor-swigging and ever-present executioner. 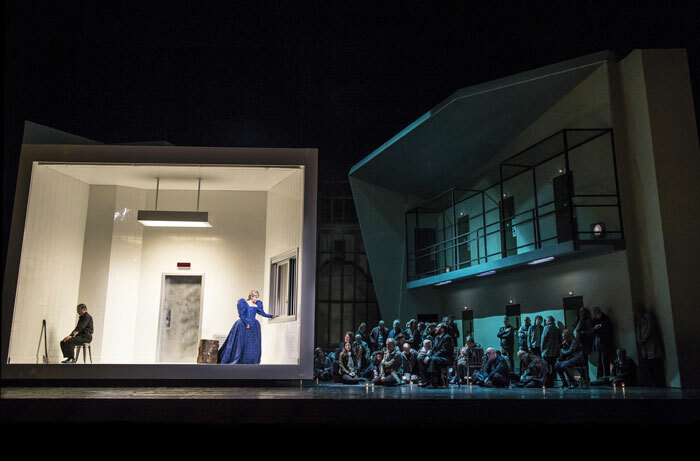 The cell was placed very downstage stage right, with the executioner in the furthest corner so that quite a bit of the audience wouldn’t have been able to see him, and not just those in seats with a severely restricted view (maybe an advantage here, but disrespectful and amateurish in design terms). Equally disturbing for me was the presence of the execution block in her cell, so when she asks that Anna accompany her on the walk to the block, she isn’t going to have far to go! So it was not a production that will encourage me to attend a revival, unless they can bring back Joan Sutherland to sing in it. But it wasn’t alas, for me, a poor production redeemed by wonderful things on the musical side. I found the conducting too imposed. Much of the first act was just too fast and driven (as I found with the Welsh National performance last year). Greater speed doesn’t necessarily mean greater urgency and drama. And some of the slow music was very slow. So while Bertrand de Billy did a splendid job of maintaining total discipline from soloists, orchestra and chorus, his tempi lacked that naturalness others have shown. The whole approach struck me as though the conductor was determined to make “great music” out of every moment by imposing his will on it, rather than accepting that it is great music that doesn’t need continual intervention. Much of the singing was pretty good. Ismaele Jordi as Leicester produced harsh sounds at the start whenever he sang out. When he sustained soft singing later on it was beautiful and he did improve as the evening went on. 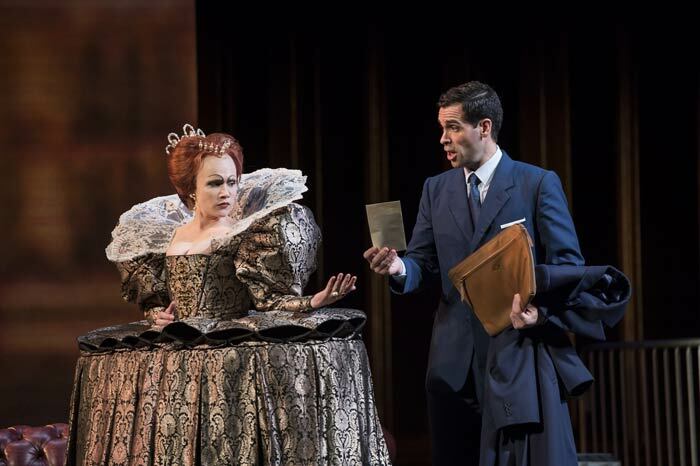 Carmen Giannattasio was fine as Elizabeth, though there was acid in her voice, which suited this part, but I wouldn’t want to hear it in everything. Clean coloratura too. A few phrases from the Talbot of Matthew Rose actually provided the greatest bel-canto pleasure of the evening. Joyce DiDonato of course brought the house down, but she didn’t give me unalloyed enjoyment. I thought she sounded a bit tired, with what John Steane used to call surface scratch in the voice sometimes evident. The end of the first recitative was uneasy – the top of that scale went noticeably out of tune though she recovered on the way down so that she ended in tune with the orchestra. I’m also not really convinced by her trills (something some of the critics singled out for praise) finding them a bit forced and not always convincing in their tuning. Of course she moulded most of the lyrical music wonderfully and I know I’m nit-picking. I must admit that my preference is for a soprano Maria, probably because I got to know the opera through soprano Marias and mezzo, or at least darker toned, Elisabettas, rather than the reverse as we had here. (I felt the same when Janet Baker sang the role decades ago and wonder what keys Malibran sang in for her ill-fated performances in 1835.) So only modified rapture, and I know well that this is a minority report. 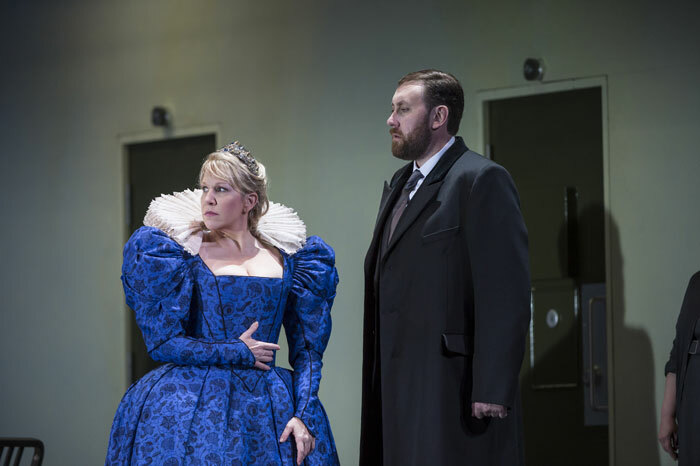 Maria Stuarda has always had a special place for me as the opera that got me interested in opera with the ENO touring production in Newcastle in 1975. I was more sympathetic to this production than Alan and by and large found it enjoyable and thoughtful. 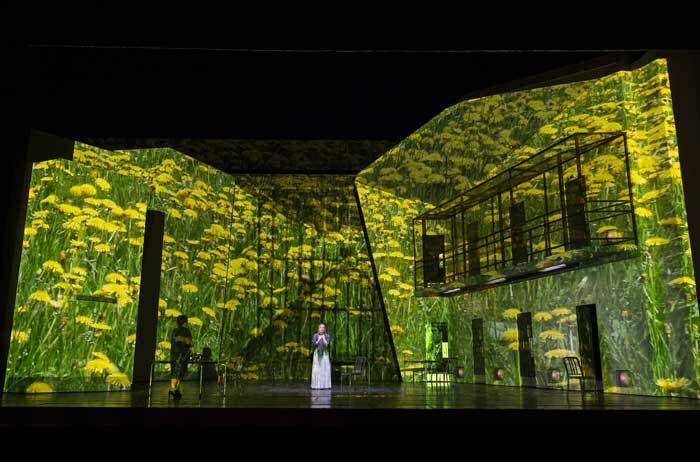 For example, in the scene where Maria is allowed out from her cell, the flowers that suddenly lit up the stage (photograph below) seemed to me to project the feeling of freedom much more directly than having her walk out into a meadow - bringing the meadow to Maria as it were. Though I agree with Alan about some of the drawbacks of the final scene, I thought the vigil and candles of the crowd at her cell brought a very modern feel to her plight and was a good example of how Leiser/Caurier wove the present with the past. Musically, I would endorse much of what Alan has written and had the advantage of going a week earlier when possibly DiDonato's voice was fresher. There is no denying that she sang exquisitely at times with feeling and much imagination. Certainly, it was an extraordinary performance in many ways but it did not have the emotional impact that I would have hoped - one admired rather than was moved. My first thought was that perhaps, as a Rossini singer par excellence she paid too much attention to individual notes at the expense of the overall shaping of the line, which is such a key element in Donizetti. Or perhaps, as Alan suggested, a mezzo just cannot provide that last ounce of penetration and excitement that a soprano can bring to the role.